BONNEVILLE DNA: A quantum leap in motorcycle engine design, the 1959 Triumph Bonneville would come to encapsulate an emerging spirit of cultural freedom, inspiring a new motorcycle movement that included legions of enthusiastic riders from artists, musicians, and movie stars to a whole generation of teenage café racers. The ’59 Bonneville became part of a worldwide soundtrack that helped liberate that new generation, and its spirit lives on today in Triumph’s Modern Classics motorbike range. 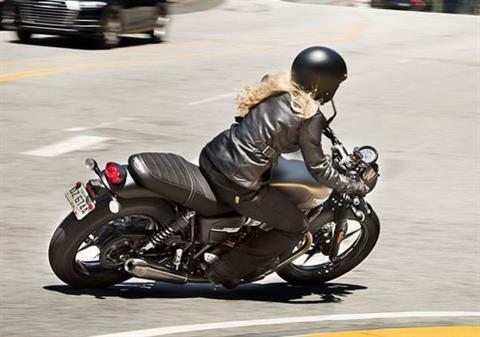 Central to this range is the Street Twin’s new and updated 900cc higher performance Bonneville ‘High Torque’ engine. MORE POWER & PERFORMANCE: A significant engine upgrade (new magnesium cam cover and new lightweight crankshaft together with its mass-optimised clutch cover and lighter clutch) has contributed to deliver much higher performance, with 10PS more peak power (at 65PS (@ 7,400rpm); a massive 18% more than the previous generation. As its name implies the updated 900cc ‘High Torque’ engine also offers a high peak torque of 80Nm @ 4,000rpm, and a new higher 7,500 rev limit, up by 500rpm. FIRST IN CLASS TECHNOLOGY: There’s more to the Street Twin than meets the eye, with a host of state of the art technologies beautifully integrated to enhance the bike’s rideability, safety and control, like new first-in-class Road and Rain riding modes which adjust the throttle map and traction control settings at the touch of a button. Ride-by-wire offers a more intuitive level of control, while liquid cooling reduces emissions and offers a greater fuel efficiency (as a consequence, you can enjoy a high service interval of 10,000 miles/16,000km). In addition, ABS, switchable traction control, accessory fitted Tyre Pressure Monitoring System (TPMS) and a slip-assist clutch provide peace of mind and an enhanced riding experience makes this the most technologically advanced Street Twin ever. 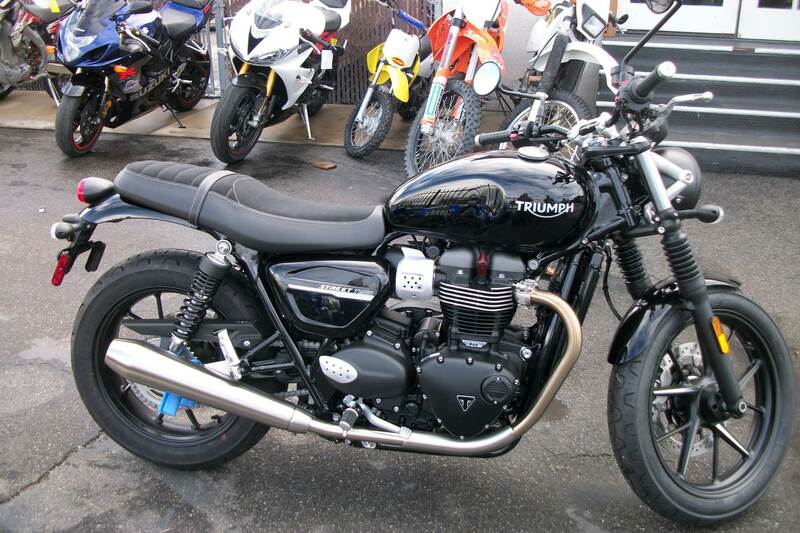 BRITISH TWIN SOUNDTRACK: There’s a certain kind of British uniqueness to the rich hair-raising sound of Triumph’s Bonneville twin engine. We feel this is how every modern classic twin really should sound, which is why we’ve tuned the engine and exhaust to deliver the characterful British bark and live up to its undoubted heritage. Rich and full, its tone matches its character and is unmistakable enough to give you all the road presence you could ever wish for. HIGHER SPECIFICATION: The new Street Twin’s higher specification equipment delivers even more rider control, enhancing its renowned dynamic and intuitive handling for a fully engaging ride. Now with Brembo front brakes for even better braking performance, cartridge forks and improved rider ergonomics for enhanced rider and pillion comfort, the Street Twin was already recognised by press and owners alike for its intuitive handling, and with this higher specification there’s even more fun to be had. SOPHISTICATED STYLING: Noted for its cool British urban stripped back custom style, the new Street Twin enjoys a number of eye-catching high quality updates that add an even greater level of refinement to this authentic Bonneville modern classic. Elegant additions such as new cast wheels with machined spoke detailing, new more contemporary tank badges, new brushed aluminium headlight brackets and more premium instrument styling all combine to enhance the beauty of this motorcycle. CONTEMPORARY BLACK ENGINE FINISH: There’s a class leading level of detailing and finish on the Street Twin’s beautifully styled 900cc Bonneville engine, including a sophisticated black paint scheme, blacked out sculpted engine and sprocket covers, original machined engine fins and those all-important Triumph maker’s mark triangle and Bonneville engine badges. Original styling cues, combined with an elegant single throttle body with aluminium finishers, deliver the finishing touches to the Street Twin’s distinctive contemporary look. OVER 140 ACCESSORIES: This accessible, customisable contemporary take on a Bonneville has over 140 premium accessories to choose from to enhance the look and capability of your Street Twin and truly create your own custom ride. Each of these 140+ accessories has been designed, engineered and tested alongside the Street Twin motorcycle, so you can always be sure of premium quality and fit that’s tailor-made for your bike. 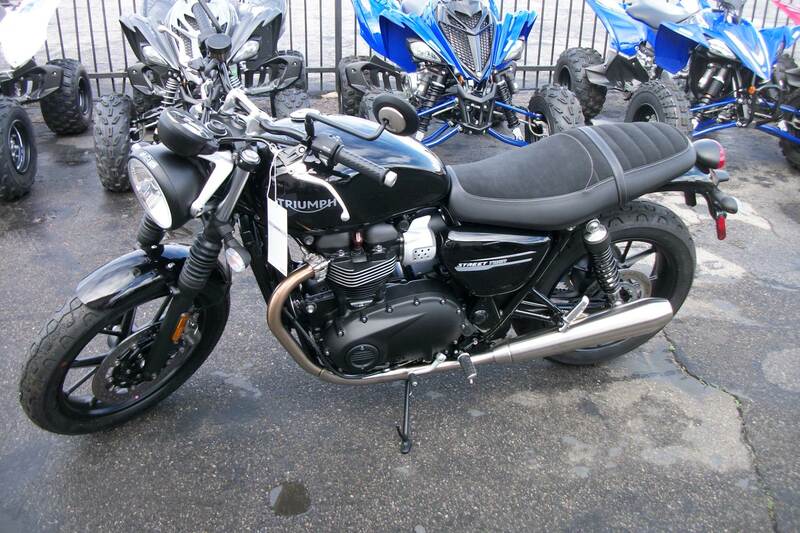 All accessories are even protected by Triumph’s two-year unlimited mileage guarantee, just like the motorbikes themselves. 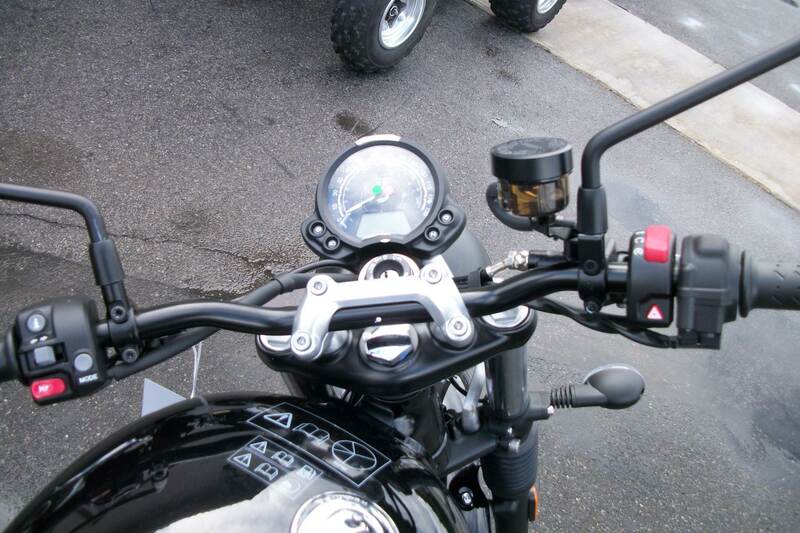 A2 LICENCE KIT: An extra benefit that makes the Street Twin even more accessible is that an A2 licence kit is readily available, enabling a unique APS twist grip and engine tune, making it even easier to own a genuine motorcycle icon. Fitted by a Triumph dealer, full power can just as easily be reinstated by having the kit removed once you have your full motorcycle license. STREET TWIN STYLE: The Street Twin’s beautiful premium character and poise has been enhanced further with even more contemporary eye-catching custom styling. Most noticeably, new cast wheels with machined detailing, and even more high quality finishing touches add a whole new visual dimension to this amazing motorcycle. Premium badging with new logos, more premium instrument styling, and higher level of finish and detailing are evident across the whole bike. STREET TWIN HERITAGE: Triumph’s original Bonneville engine provided a thrilling riding experience and was justifiably adored by a new emerging generation of motorcyclists who, back in the 1950s and 60s, were shaping a cultural explosion with a spirit of individuality and freedom. 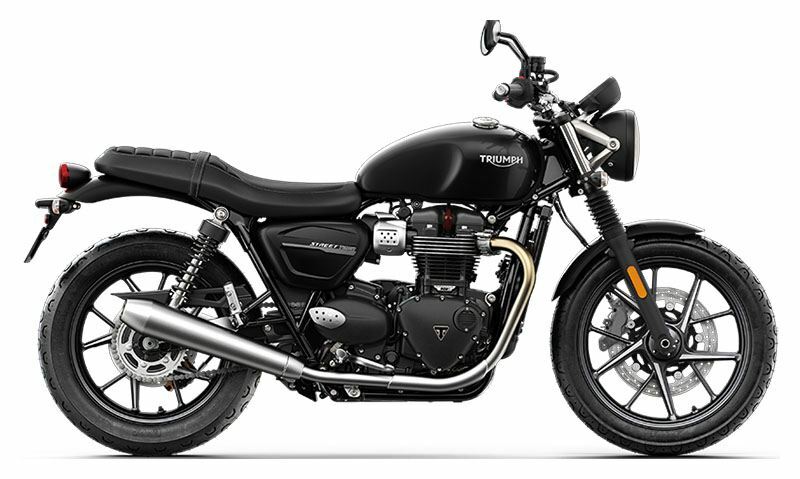 Reborn for a whole new generation of riders today, Triumph’s 21st century Bonneville line-up all feature the very latest evolution of the iconic torque-heavy Bonneville twin - majorly updated for 2019 models. 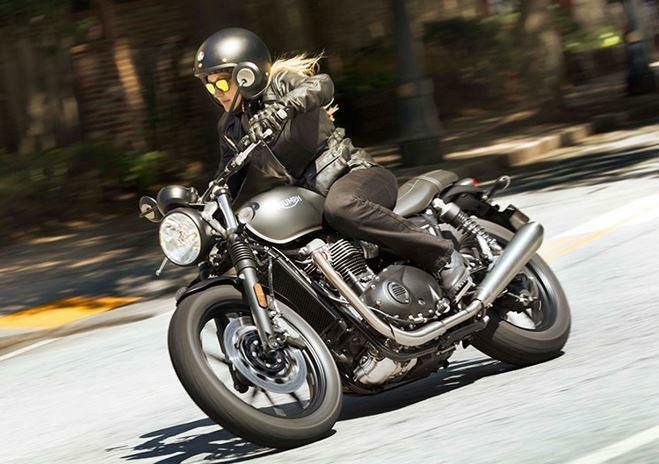 The beautifully modern 2019 Street Twin brings even more of what has made it our biggest selling modern classic – more power, more performance more technology and an even higher specification of equipment. 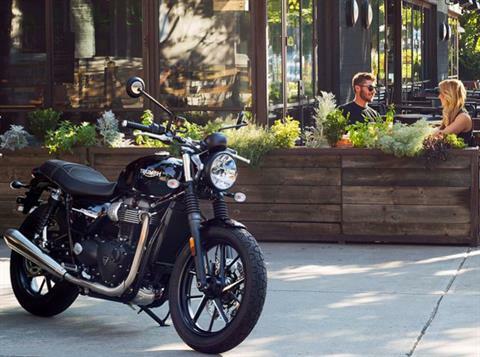 Together with its internationally acclaimed accessible and confidence inspiring ride, and over 140 custom accessories, the Street Twin is central - all over again - to a whole new cultural motorcycle revolution. STREET TWIN HANDLING: In addition to its unparalleled heritage, the Street Twin now represents a significant step forward in confident dynamic handling for Triumph’s most successful custom classic. 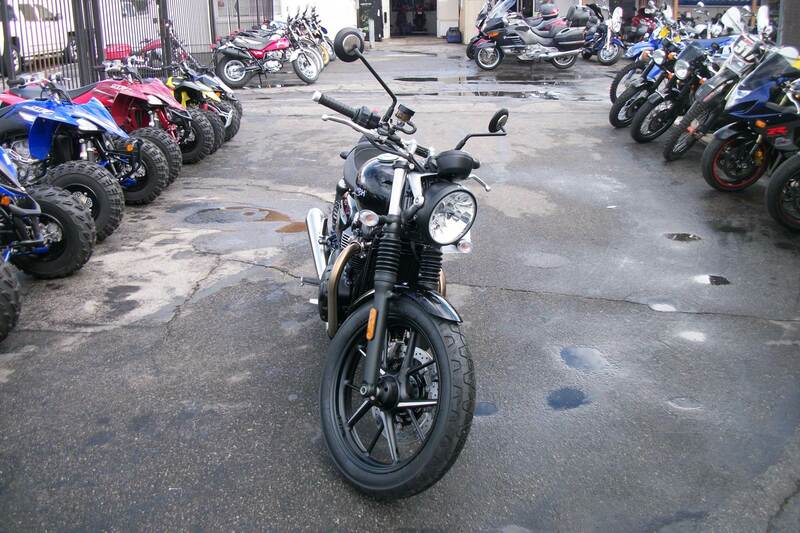 Everything about this bike has been designed to provide greater control, and increased rider and pillion comfort, to such a high level that you’ll only fully appreciate its ease of handling, relaxed balance, eager responsiveness, and rider-focused technology when you ride it. STREET TWIN TECHNOLOGY: The 2019 Street Twin sets the benchmark for first-in-class technology with new Road and Rain riding modes, which no other bike in this category features as standard. Add to this ABS, switchable traction control, a slip-assist clutch, accessory fittable Tyre Pressure Monitoring System (TPMS) and its distinctive and contemporary LED rear light, all beautifully integrated, and you have a truly modern and capable ride. STREET TWIN CUSTOMISING: The Street Twin is accessible, fun to ride and perfect for customising, and owners in their thousands continue to be inspired to personalise their new Triumph, with countless accessory options (in fact, over 90% of Street Twins sold to date have been fitted with Triumph-custom accessories). And, reflecting the Street Twin’s unique versatility, the professional custom build world has been inspired to create countless amazing transformations. This is Bonneville power and DNA at its most accessible and, whatever your age and experience, it’s the perfect opportunity to personalise your bike and enhance your ride even more. 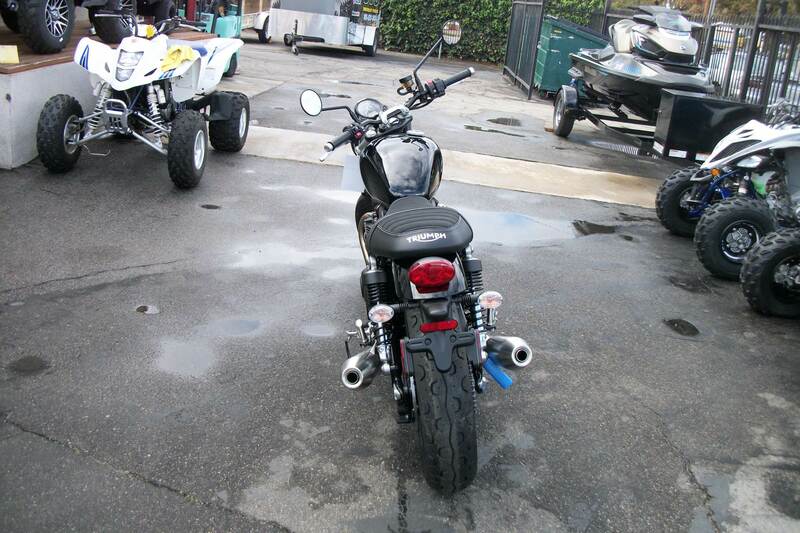 This is a bike that truly appeals to a broad mix of riders in terms of age and experience. Discover the new higher specification 2019 Street Twin’s extraordinary capability, style, and neutral handling for yourself.